They’ve been through this process many, many times and know the questions to ask to help discover any challenges and issues with the remodel even before they show up. What’s the size of your family? Are you retired and only cook for 1 or 2? Or do you have large family dinners with lots of extended family that will take lots of room? Do you like to cook or will you just heat and eat your food? Will you throw dinner parties for friends and family? Do you like the sleek, clean lines of industrial kitchens or the warm, comforting feeling of French country decor? Find some inspiration here. Is there enough space to store all your cupboards once they are assembled, but before they’re installed? Will your HOA allow the demolition dumpster to be parked for a short time in front of your home? Before beginning a kitchen remodel, it’s important to take your lifestyle, taste or aesthetics, and the logistics of the remodel into consideration. This way you’ll get a clearer picture of what you need, what you want and what you can actually do. The kitchen’s size will dictate what can include. Enlarging a kitchen will be a totally different project from updating the cabinets, appliances, flooring, and fixtures. Size impacts what can be used in the kitchen and how cluttered it can feel. It is important to remember that while square footage is important, height also plays a role in the design. Your budget will determine the type of materials you can use, the quality of appliances and fixtures and if your space can be enlarged. Give your budget a 20% cushion. This way any surprises will not force you into going into more debt. In some cases, a cosmetic change is all that you need, like changing the countertops, floor material, and paint color. In other cases, you’ll need to take more drastic measures like knocking down a wall or adding an island. This is not a decision to be taken lightly, as literally anything is possible. 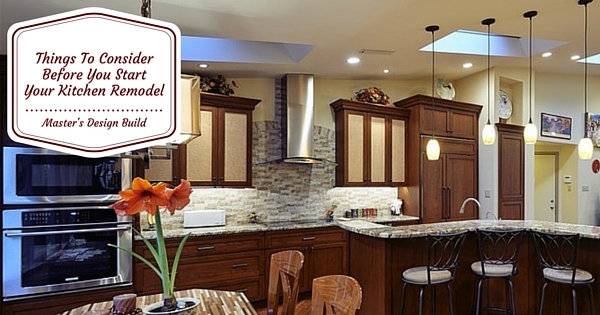 Structural issues must be addressed before the kitchen remodel can take place. Mold and mildew must be removed completely. Subflooring must be free of water damage and sound. Plumbing and electric must be brought up to code. Do you love to cook? Will you entertain by throwing dinner parties? Do you have large family gatherings and meals? Your answers will determine the size of your work area. You may need a large prep area or a large serving area. 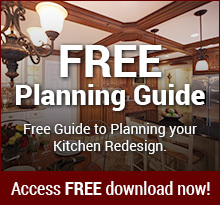 These considerations will determine the kitchen’s workflow and your finished result. Cooking, clean-up, and refrigeration are the components of the kitchen work triangle. Where your sink, stove, and refrigerator determines how the kitchen will be used. When this triangle intersects a walking path, it becomes inefficient. Making this triangle a part of the design process is both practical and aesthetically pleasing. Where will you prep your food? Do you have enough counter space? How will the clean-up be handled? This is one of the most important practical aspects of the kitchen’s design. Not enough counter space and you can’t prepare your food, too much counter space, and you’ll be walking miles from the refrigerator to the sink. Master’s Design and Build can help you think through all of these considerations and even more. We have 20+ years of construction experience and have made the process as simple and stress-free as possible. We’ve seen just about everything, and we can help you design and build your new kitchen. Contact us today to get started!